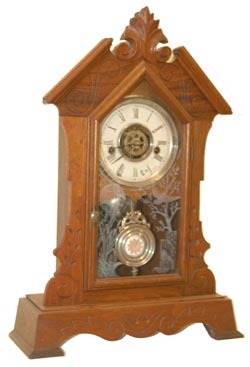 Waterbury Clock Company parlor clock, "Salem", C. 1881. Walnut case, 19" high, near perfect and all original. It was refinished and cleaned of the smoke and black gunk, and now needs some Tung oil or Nu-Life. This is a one day clock, strikes and alarms, both on a nickel bell, and running just fine. The pendulum, dial rings, alarm ring, bell, and even the glass, all match. Glass is perfect. Ly-Waterbury #1575.